The Tales series gets a special installment for its 15th anniversary. Not unlike Spinal Tap, the Tales series is really big in Japan. If you don't count spinoffs, then we've seen only about half of its entries on this side of the Pacific. If you had asked the crowd at NYCC 2012 whether that's enough, of course, you would have gotten a resounding "no. "An enthusiastic horde of fans showed up for a panel on Japanese game development where one of the guests was none other than Hideo Baba, the producer of the Tales series and one of the minds behind its latest installment, Tales of Xillia. In addition to sharing his thoughts on the game, Baba went into some detail about the challenges the Japanese development community faces and how it can evolve in the years to come. One of the most recognizable features of the Tales series is its action-packed battle system, and Baba promised that its latest iteration would not disappoint. The basic structure of the battle system resembles Tales of Vesperia more than the recent Tales of Graces f, as characters can roam freely around a 3D battlefield while chaining basic attacks, which are free, and Artes, which cost magic points. The most notable change is in its "Linked Artes" system, in which two characters can combine their powers in order to maintain a fast and furious stream of attacks that can keep an enemy staggered. Another notable change is the ability to choose from two protagonists: Jude Mathis, a martial artist, and Milla Maxwell, an elemental mage. The actual plots in the Tales games tend to follow a pretty predictable arc, so the series has instead relied on weighty themes and original characters to make compelling narratives. 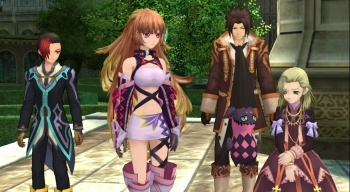 This time around, Tales of Xillia will revolve around the nature of belief, and how the quality of believing can affect a person either positively or negatively. Regarding the characters, Baba asserted that "The most challenging aspect is trying to create characters that are different from [the characters in previous games]." Baba has a point: Since Tales of Phantasia debuted on the Super Famicom, the series has had about 100 playable characters and party members. However, for the 15th anniversary of the Tales series, two of the most beloved series artists - Kōsuke Fujishima and Mutsumi Inomata - will team up for the first time to give each one a unique look. Baba also had quite a few things to add about why Tales has been reluctant to embrace Western gaming conventions and where the series can go from here. "Our games have a unique sense of Japanese culture," he explained, maintaining that while Western developers have put out some remarkable games, none of their mechanics would feel at home in a series with so many Japanese tropes and references. When asked about the possibility of a multiplayer title (not counting the failed Tales of Eternia Online), Baba replied, "We don't know if we'd be able to do multiplayer justice." Being able to create your own character, he argued, would diminish some of the story aspects that make JRPGs unique. While Baba could not elaborate on whether some older Tales games might eventually make their way to Western shores, he did express interest in working on mobile titles in the future, especially with the proliferation of iOS and Android devices. "Rather than worrying about hardware, we try to focus on character and story," he said. Fans can see if he lives up to that ethos when Tales of Xillia launches in North America next year.